Each month, you’ll receive online access to your weekly lessons, called monographs, to read in the privacy of your own home. The lessons, about six to eight pages each, introduce certain ideas and experiments in a straightforward and simple manner. We ask that you devote about one and a half hours once a week to study that week’s lesson and perform any exercise or experiment given. For the remainder of the week we encourage you to periodically think about the important ideas contained in that lesson, and make repeated efforts to accomplish each exercise. We ask you for this simple commitment because the lessons are not just a body of knowledge, but a way of life. If you only read them and don’t attempt the experiments or practice the techniques, then you’re only learning theory, just as if you only read a book on how to play the piano, and yet never practiced playing one. It takes dedication to begin one's quest for the knowledge of the Universe. It is essential that you test the ideas and experiments, prove their validity to yourself, and then incorporate them into your life. As you do this, mere theories will be replaced by real knowledge, solid skills, increased confidence, peace of mind, and an ability to create the life you want. 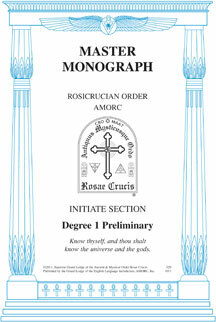 New students begin with a series of three introductory Degrees comprising an overview of the Rosicrucian course of study. This is followed by nine additional Degrees, each having its own particular emphasis. For instance, the Fifth Degree deals primarily with ancient philosophies, the Sixth with the health of the physical and psychic consciousness, the Seventh with the aura and the projection of the psychic body. The teachings are continuously updated to reflect our modern world, while keeping true to the traditions of the Order. Underlying this changing language and format is a code of natural law which forms the core of the Rosicrucian teachings and which remains constant over time. The Rosicrucian system does not promise instant enlightenment. To complete our basic program of lessons, from the introductory courses up through the end of the Ninth Degree, takes approximately five years. Although in five years you will have achieved a high level of mastery over self and your environment, our teachings continue past the Ninth Degree for many years, supplementing the basic lessons and continuing to stimulate further development. The uniqueness of the Rosicrucian teachings does not come simply from the body of knowledge it offers, but also from the way in which it is organized and brought to life through practical exercises and experiments to produce a genuine evolution in consciousness.